Courtney and I just had our annual cookie party. Well, it will be annual from now on. It was terrific fun. A bunch of our friends from DC came, and they all brought delicious concoctions. Courtney really outdid herself. She made chocolate-dipped, homemade marshmallows. Wow. Who knew you could even make marshmallows from scratch? 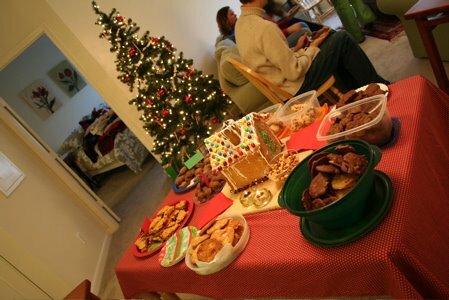 We also had chai, a hot chocolate bar and punch to complement the cookies. I ate a ginger bread cookie that was unfortunately covered with food coloring gel, which made me look like I had eaten a smurf. We listened to the O.C. Chrismakkah album and a good time was had by all.